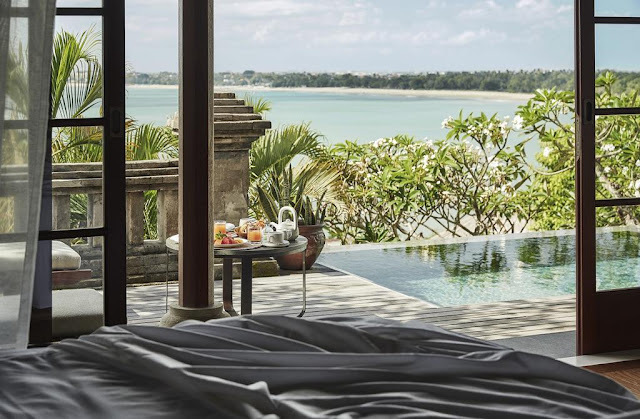 Four Seasons Resort Bali at Jimbaran Bay has reasserted its peerless status with the completion of a two-year renovation, launching Bali’s most exclusive beachfront villas and upgrading facilities and services across the resort. The freshly-minted Imperial and Royal Villas complete the dramatic transformation of the resort’s entire accommodations while preserving the authentic ambience of its original Balinese village architecture. Divided into seven ‘village squares’ each with a village chief to deliver a Four Seasons experience, 147 pool villas are cocooned within the high walls of traditional Balinese dwellings. Inside, they present a fresh, contemporary design, spacious interiors and the ultimate views across the sunset coast and curving Jimbaran Bay. Located just steps from a tranquil three-mile beach, the three-bedroom, two-storey Imperial Villa is the most coveted of sanctuaries featuring multi-level living spaces, residential-style kitchen and dining area, infinity pool, fitness studio, and unique in-villa services such as private breakfast chef, personal trainer and yoga master, night-time spa rituals and Balinese royal banquets. The Imperial Villa’s individual design also offers a stunning ocean-edge venue to host private celebrations and weddings for up to 80 people. The resort also added a new ocean-front venue for spa treatments and yoga; an artists-in-residence programme for guests to learn woodcarving, weaving, painting and dance; heli-surfing, sunset cruise and water biking adventures; and unique Customised Dining concept at Sundara, the southern peninsula’s hottest dining destination and beach-club. These activities enhance existing programmes including half-day courses at the state-of-the-art Jimbaran Bay Cooking Academy, transformative rituals at Healing Village Spa, and temple tours and offerings with the Balinese-Hindu priest. What hasn’t changed: the legendary service. Roughly 60 per cent of staff have been with the property for over 20 years, and management kept the entire team employed full-time throughout the two-year renovation.